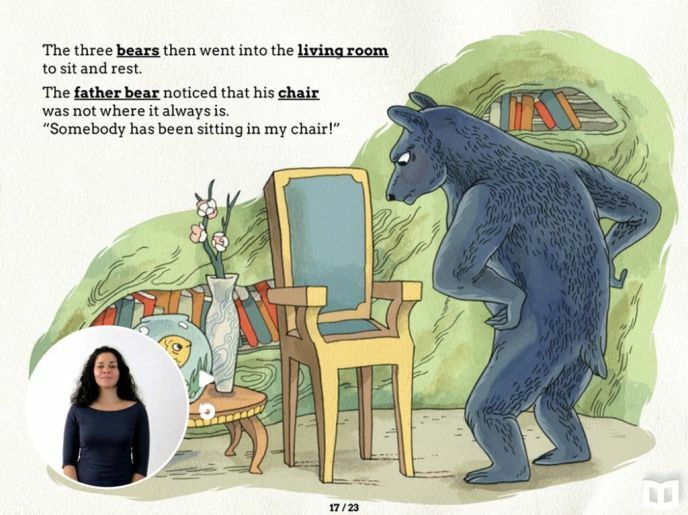 A page from eMotion’s Goldilocks. Eyal Rosenthal doesn’t expect to make a mint from his new eMotion Stories digital books in English and American Sign Language. The world’s first interactive bilingual e-library for parents of children with hearing impairment was created as a labor of love, though the market is quite limited. Rosenthal, an American who moved to Israel in 2008, expects only to reap the satisfaction of bringing a new dimension into the lives of children who otherwise would miss out on reading classics with their parents such as Goldilocks, Cinderella, The Ugly Duckling, Little Red Riding Hood andThree Little Pigs. Each of the interactive fairy tales features pictures by world-class Israeli illustrators and is narrated in American Sign Language, in synch with the text, by deaf actress Alexandria Wailes. Soft-launched last May, eMotion Stories offers a free download of its iPad app along with the first book; additional e-books can be purchased for $3.99 apiece. His idea arose in September 2012 over coffee with a friend who has a deaf niece. Rosenthal had just read his nephew a bedtime story, and asked his friend if she’s able to do this with her niece. Armed with his vision, Rosenthal – a Tel Aviv resident who does business development and product management at Leumi Tech – got hooked up with the developers at Tel Aviv’s Go UFO web and mobile creative application agency. “Without them it could not have occurred,” he says. Rosenthal’s concept struck a chord with him. “So-called ‘normal’ children can hear bedtime stories about princesses and dragons, but a hearing-impaired child misses out on that,” Goldenberg says. Believing that the most important aspect of a children’s book is the illustrations – yet hampered by a shoestring budget – Goldenberg approached his father, illustrator Mirel Goldenberg. His father drew the pictures for The Ugly Duckling and also brought to the project top-flight Israeli colleagues Noa Liberman and Shiraz Fuman, who agreed to work for minimal remuneration. A page from eMotion’s Ugly Duckling. Rosenthal, who grew up in Tenafly, New Jersey, contacted a friend from college now working as a videographer for News 12 New Jersey. His friend agreed to film Wailes doing the American Sign Language translations. Because every country has its own sign language, the creators of eMotion are offering their “white-label” platform to other developers at no charge. Rosenthal hopes to find some time to launch an Indiegogo crowdfunding campaign to finance an Israeli version of eMotion Stories and to produce additional storybooks in response to enthusiastic feedback from parents using the app. “It was definitely a challenge, but it’s been an amazing experience,” he says.